2016 was dubbed ‘the year of video’ by top marketers and event professionals across the globe. Brands big and small have turned to the screens to showcase their offerings and really hammer-home their brand message and ethos, in as little as two minutes flat. But why does video work so well to market something successfully for businesses? And what could this mean for established or aspiring events companies wanting to pack more of a punch with their latest portfolio or proposal? We think this rise in video as an informative and effective promotional tool is long overdue. But, we’re glad that fellow creatives in the event production and marketing industries are finally giving specialist video production the airtime it deserves. 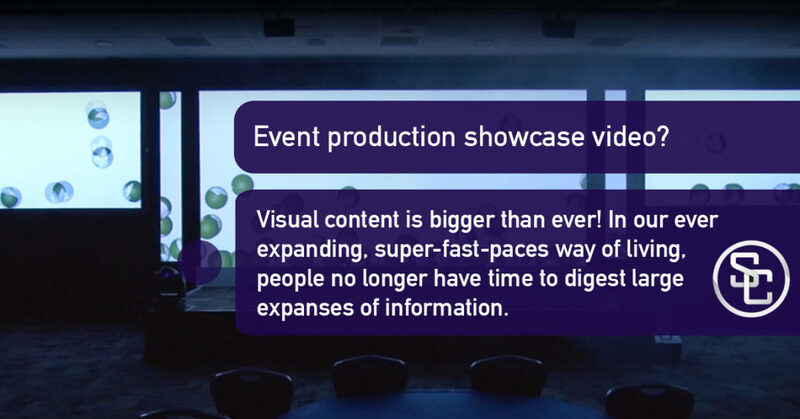 Here, we take the time to consider how and why using a showcase video could be the secret for all event production companies. If you haven’t already turned to showcasing your work through video, we hope that after reading this you will want to, and quite possibly need to. Towards the end we have included one of our recent showcase videos, after all, a topic of this kind deserves to end on a visual note. You know what they say, seeing really is believing. Why does video REALLY work? On the whole visual content is bigger than ever. In our ever-expanding, super-fast-paced way of living, people no longer have the time to digest large expanses of information. They want accurate, useful information and they want it fast. This gives brands, SMEs and event production companies a window of opportunity to create and offer them something worth watching. Team this with the fact that 90% of the information our brain processes is visual, you really good have a recipe for success if done properly. People also love to be told a story. They like to see things unfold, to be surprised at the end or for things to come to a satisfying or noteworthy conclusion. Video can do this more efficiently than text, allowing you to connect, tell a story and share experience with your target audience. To tell a story in a way that no other brand or, in this case, specialist event production company can. Keep this in mind when planning your next event showcase or marketing video. How can video enhance and excite your next event production proposal? For b2b audiences, video can be very effective too. Sometimes clients struggle to envision your end goal, they love your pitch, but what will it look like? how much work really goes into this sort of thing? As an event production company, who offer specialist services like video production and projection mapping, sometimes clients need to be shown, rather than told exactly what we can and do offer, and let us explain why. Working in events production we are constantly drawn to visuals. We envision all of our events and drive efficiently and determinedly to make this vision a reality on a daily basis. Whether it’s a swanky corporate networking event or a five-star daytime conference, we don’t just see an empty room, we see a blank canvas. A white space ready to be sketched upon on brought to life and with so many options and opportunities in our minds, the possibilities are endless. But, sometimes clients struggle to see this potential. They may simply lack the vision. So, in this case, it is easier to show them the potential, rather than just voice it to them, and why should they take your word for it anyway? A showcase video doesn’t have to be complicated. It can be a clear and professional example of the way you work. When seeing is believing, our latest successful event production video example. By providing a good event production showcase video you are not only stating what you can do but showcasing what you have done in an exciting way. Any good showcase video will take your pitch to the next level aesthetically and in the ‘year of the video,’ your video showcase will be warmly received and most importantly, valued. It can be tricky to win new customers around, but sometimes, a good showcase video is all it takes to bag your next event production job. At Stage Connections, we provide full specialist events production services, projection mapping and specialist video production. If you are interested in any of our services then please contact us directly. If you enjoyed our blog then find us on Facebook, LinkedIn and Twitter for regular industry insights.